On Friday, a new Apple commercial showcased Grande's "7 Rings" single in the form of an Animoji music video. Although the overall video is greatly enhanced by video effects and production, the main subject, Grande's face, is a great demonstration of the kind of customized faces you can now create using Apple's Animoji tool. 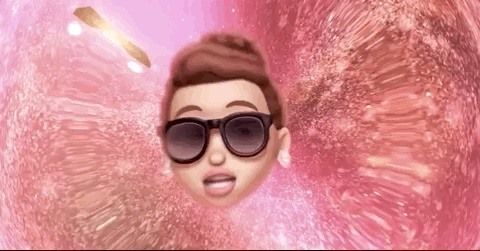 Along with Grande's virtual performance, Apple also posted Animoji videos for R&B singer Khalid and country music group Florida Georgia Line. Like Grande's, both videos are fairly elaborate productions that can't be directly duplicated on the iPhone, but they do accurately show off the precision syncing of Animoji when used to mirror the facial, eye, and mouth movements of the user. Although we haven't seen much evidence that Animoji are being widely used by most iPhone users, Apple is nevertheless continuing to promote the feature and recently added more to it. Earlier this month, Apple released iOS 12.2 beta 2, which includes four new Animoji, including a giraffe, an owl, a shark, and a wild boar. At this point, Animoji are stuck in the tiny rectangular screen in your hand. But it's not a stretch to imagine a world (in the very near future) in which Apple AR smartglasses allow you to hold an entire conversation with a friend who happens to be wearing an Animoji face mask of a panda bear — its cartoony eyes and furry mouth moving perfectly in sync with your friend's real face — as long as you keep your Apple AR smartglasses on. If all the rumors turn out to be true about Apple's 2020 (or 2021) AR smartglasses, it's likely that Animoji will soon become far more important than anyone realized.